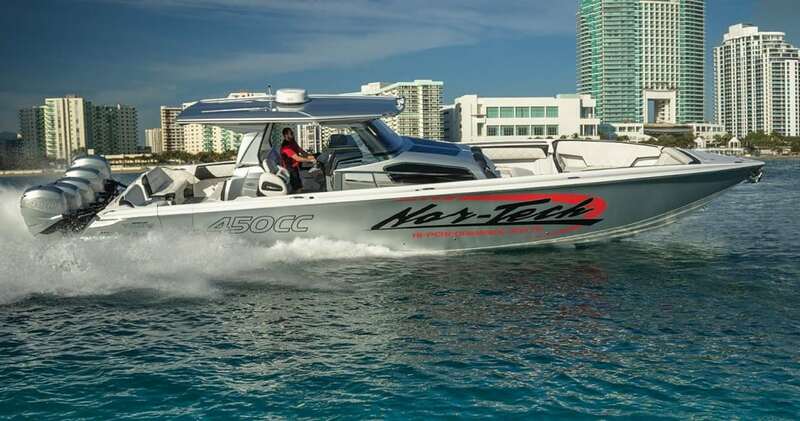 The Nor-Tech 450 Sport reveals the company’s unlimited enthusiasm for the art of the boat. The word passion is often thrown around when it comes to the creative process. Sometimes its casual usage occurs more flippantly than others, rendering the term almost meaningless. This can be particularly applicable when it comes to the art of boat building. It seems obvious—of course everyone has passion. But what happens when passion truly manifests in a craft? You get a result driven by unlimited enthusiasm, which is what Nor-Tech has accomplished with the Nor-Tech 450 Sport Center Console. When Nor-Tech was established in 1990 by Trond Schou and Nils Johnsen, it soon became clear that the pair had a vision. This vision was embodied by the early creation of a 50-foot V-hull. 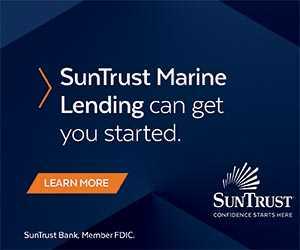 And while the original model didn’t become an overnight sensation after the company moved to its current location in Fort Myers, Florida, it did mark the beginning of a legacy. It’s this legacy that led to the conception of Nor-Tech’s current lineup of high-performance powerboats. Nor-Tech’s 45,000-square-foot facility assists the company in the production of a wide range of models. This lineup ranges from the next generation of the 5000V (currently the 527) to turbine-powered offshore catamarans. However, Nor-Tech’s most popular models consist of their outboard-powered center consoles, which have come to dominate the company’s current production. Fortunately, I was able to take a look at the Nor-Tech 450 and see passion in person. You might have already seen the boat if you’ve ventured to a major boat show within the past year. And honestly, that first glimpse is an unforgettable experience and one which inspires a sort of reverence. At its debut during the 2016 Miami International Boat Show, it was obvious that this center console could seamlessly blend elegance and performance in a market where everyone claims passion. The 450 spans an impressive 45 feet in length and flaunts a 12-foot beam. It’s impressive from a distance, but up close the vessel exudes both capability and fluidity. The sweeping T-top seems almost futuristic with a clean design that minimizes obstruction at the helm. This is a center console that signals a dedication to performance and meticulous attention to detail at first glance. This 450 Sport is powered by five new Mercury Racing Verado 400R outboards installed on the transom that pump the vessel with a combined 2,000 horsepower and nearly head-snapping acceleration. And while several power options are available, this package is right on target and achieves a top speed in the mid-80s. If you have an inner predilection for speed, it doesn’t get much better than this. Although it has an impressive power package, Nor-Tech doesn’t rest on those laurels. 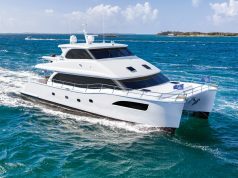 Instead, it boasts a variety of other design concepts ranging from a solid hull bottom construction of hand-laid fiberglass to true Kevlar/carbon fiber. 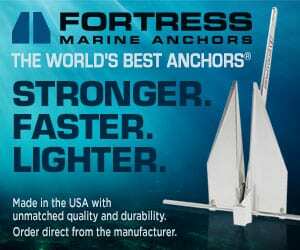 Streamlined construction with lightweight materials removes unnecessary weight from the frame and body of the boat and allows it to easily open up with the touch of the throttle. While few would accuse Nor-Tech of minimalism, there is a surprisingly simple approach to the Nor-Tech 450 Sport interior and exterior design. Although the boat maintains a sporty construction, there are no unnecessary frills or excess components. Instead, each and every single implement in the design serves a particular function and some in more ways than one. The stern features premium bench seating with every detail carefully selected down to the custom stitching. A simple flip of the seats reveals ample stowage offering a stylish design that provides more interior space than you’d typically expect. As a result of the 12-foot beam, Nor-Tech was able to construct a console that is perfectly suited for accommodating three people comfortably. The spacious, flat panel on the helm accommodates two chart plotters, and an optional third chart plotter can be installed. The console is the control center for the entire boat, and its arrangement of instrumentation allows for easy operation and accessibility. Carbon fiber details only add to the sense of luxury and comfort evoked by the 450’s design. Crow’s enthusiasm for the vessel was obvious as he showed me each feature from stern to bow. In front of the console, luxurious seating arrangements (complete with a large sunpad) provide comfort, safety and stability, as well as a spacious gathering area for passengers. This boat particularly shines while entertaining, whether cruising with family or friends. This particular 450 is Nor-Tech’s test model and the company strives for continual improvement with each hull sold. Additional features are added with a touch of ingenuity that goes beyond the basic requirements. For example, side wings block wind from passengers reclining behind the console. But instead of a canvas or plastic construction, the side wings are made of premium carbon fiber and mold back into the side of the console while not in use. One of the most unexpected features of the vessel is its versatility. 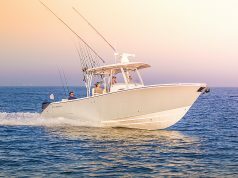 Since every 450 is custom-built to owner requirements and specifications, there is a nearly endless list of possibilities and options. For example, the boat can be fully rigged for sport fishing, complete with multiple livewells and ample rod storage. Or, it can be outfitted for family cruising, with expanded seating options and room to lounge. A hatch in the helm console provides access to the cabin and head area. The cabin is surprisingly roomy and well lit; spacious windows allow a flood of natural light. A large berth with additional seated headroom would allow a couple to sleep comfortably overnight. Customization options also continue with the cabin; it can be outfitted as an interior galley to provide catering options for everyone on board. On the water, the 450 remains remarkably solid and stable, even in sloppy conditions with considerable chop or cornering through a wake; it doesn’t budge and requires minimal steering or trim correction of the outboards. This is how a boat should ride, and Nor-Tech does it remarkably. At the end of the day, real passion lives on in the form of the Nor-Tech 450 Sport. There isn’t any praise I could give the boat that it doesn’t deserve. It does virtually everything right, without surprises and without pretense. Purpose points this center console in the right direction, but passion is what propels it.